This question comes up a lot these days from my wife's friends: "..the stock market is down, should we sell?" My answer is always "NO" based on the principles outlined in the Investing Philosophy Part 1 blog post. Transactions have costs which hurt your returns. Maybe an easier way to look at the situation is to draw an analogy to buying steaks. If you heard that the Supermarket was selling Tenderloin steaks for $15 a pound, down from $20 last month, you would say it is a good time to buy steaks. Well, the companies listed on the stock exchange have not changed much in the last month and you can now buy them for 10% less than what they cost last month, so isn't it a good time to buy? Just to prove that I am not a hypocrite, or not as big a hypocrite as you might think, I decided to check on my track record of buying and holding during a market downturn. I pulled the transactions from the worst downturn in the past 20 years, February to March 2009. I was a net buyer of stock mutual funds during this period, and I also bought less risky money market and bond funds as well. The table below shows some of my stock purchases during this time. The returns over the last 5 years shown in the last column are very good as we all now know that the market has gone up since early 2009. However, I vividly remember the talk at the time around the watercooler was all about selling stocks, buying gold, holding cash, etc. There was even a little discussion of the appropriate firearms to buy, but that might have been at the bar, not the watercooler. Anyway, the answer is no, don't worry about the market, keep a diversified portfolio and sell when you need to either re-balance or need the money for something useful. Canada Pension Plan (CPP) versus US Social Security (SS) - "Star-Spangled Happiness" or "On Guard"? Doing the Canadian Financial Planning course allows me to look at the US and Canadian government retirement systems. One would think that good old collective high tax Canada would have a better system, right? Well, maybe not, it depends, your results may differ, etc. etc. Maximum CPP benefit per month at 65 is $1038 Cdn. This is fully taxable. OAS is clawed back (taxed back) starting at about $31,000 yearly income for a couple (it's complicated) and it is completely clawed back (you lose it completely) at around $116,000. Anyone with appreciable savings, a pension, or who starts to draw on their RRSP will generally lose some or all of the OAS. Even if it is not clawed back, OAS is taxable. Summary: a person will get up to $2085 Cdn per month, but more likely you will get around $1,000. It is taxed. Health care is provided by Medicare with premiums of $117 to $405. The top premiums are for people earning well over $400,000 US. Compare that to the clawback limits on OAS above. The system is complex (parts A, B, C, D) and seems to be designed to ensure that anyone with reduced mental capacities will not be able to figure it out. Maximum Social Security and Medicare tax for a working person is $8,950. Maximum Social Security is $2,642 at age 65. This is only partially taxed. If you earn over $44,000 as a couple, 85% of it will be taxed at normal income rates. This is not a clawback, just a normal income tax. Summary: a person will get up to $2,525 per month after paying for Medicare, if you were a high income earner and have appreciable savings, pension.. you will likely get about $2,300 per month and 85% will be taxed. Is Canada Standing on Guard for You? Can we Settle this on the ice? Continuing on my dual path to a second career: consulting while learning to be a financial planner. The learning bit is progressing as I churn through the online course. The consulting opportunity bit is slow. A few leads from contacts, some correspondence, but nothing solid yet. This seems to be a common approach when I check up on many of my old colleagues from Nortel - many of them are running XY Consulting Inc, where XY are their initials. If I start a consulting corporation, I will definitely not be calling it MW Consulting Inc. It is a tip off that you are a one-man-band consulting outfit. For the past 7.5 years, I used a company phone for wireless, which was good because it was free but bad in that you had to use what you were given. No Iphones, no broadband data until 2013, no Android Apple Cobbler (or whatever they call the latest version). The new trend in Mobile is "Bring Your Own Device" for both the enterprise and the operator. People sometimes want to use their personal device for work, and they also often want to buy a device to use with their wireless carrier, rather than taking what is offered and signing up for a two year contract. Cheap nasty Android phones from no-name companies cost $150-250. Not interested. Decent Android phones like Nexius 5: $350-450. A possibility but I wanted an Iphone (like the Youtube clip). New Iphone 5C or 5S: $600-$800. Expensive. Being economical (nice word for cheap) and hopefully smart, I reasoned that there is nothing you can do to refurbish an Iphone as it is a totally sealed unit - it either works or it doesn't. Given that Ebay says I will get my money back if I do not get what I ordered, I bought a used Iphone 5 for $340 and it seems to work like a charm. I doubled down by going to Best Buy and asking them to price match with Amazon on a case and saved another $20. So it is BYOUD for me. Why would I consider this? We saw a great new show last night, "Beautiful", the musical about Carole King. It is a fantastic show with a great cast including one very talented Canadian, Jake Epstein, and Jessie Mueller as Carole King who is awesome. I highly recommend it. They even sang "On Broadway"! Anyway, a job on Broadway would be great, except I don't live in New York, have no experience, no training, and no idea what jobs are available. It is nice to dream. I am taking the Canadian CFP course as a purely online course. No help as far as I can tell, you are on your own. Tests have to be multiple choice or have unambiguous answers. No learning from other class members. I did not realize the value of getting live help or doing an old-style written test. For example, one test had a clearly wrong answer, but there was no one to alert in real time, my answer was just marked wrong. In another example, I had to round the numbers to nearest dollar and if I did not, it was marked as incorrect. I guess the MOOC (Massive Open Online Course) concept is going to be a little more difficult than the blogosphere seems to think. Anyway, I am continuing the course. The only other thing I noticed is that the Canadian "social safety net" for retirement is not as good as I thought. Maybe I should have expected this since Nortel pensions were better insured by the US government than in Canada. P.S. I removed the moderation of blog comments. This Part 2 blog entry will cover my approach to diversification and bonds. Diversification is simple concept epitomized by sayings like "don't keep all your eggs in one basket". If you rely on a small number of investments, your return could be hurt badly by a few random events. For example, if you owned 10 stocks and one was BP, you could lose a lot when they had a big oil spill in the Gulf of Mexico. On the other hand, if you owned 100 stocks, and the same unpredictable event occurs, the effect would be small, and might be offset by a positive event in another stock, say the announcement of a lifesaving drug by a drug company. You also reduce your risk by combining different types of investments. If you had a 50-50 split of bonds and stocks last year, you would likely beat an all-bond investment mix by around 15%. So diversification reduces risk and I won't go much further into the different types of risk. 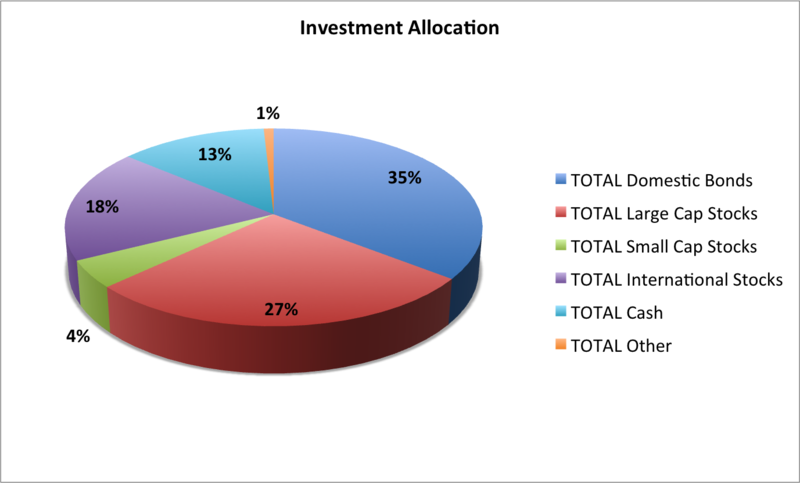 My investments are diversified as follows (this is a pretty conservative allocation). Bond investing to me is rather straightforward. Bonds give you income with lower risk since you are first in line to be paid by a company before the equity (stock) owners. Typically, bonds return less than stocks but are less risky. In the USA, there are three factors that drive bond investments for the average investor. It is costly to find and acquire individual bonds. Bond ETFs and mutual funds are available with very low expenses. You can save on taxes if you buy Municipal Bonds in your taxable accounts versus regular government or corporate bonds. Otherwise, you pay full state and federal income tax on bond income. Indexing gives you low costs, lower risks, and diversification (see Part 1). So I typically keep index mutual funds with taxable bonds in my IRA and 401K and municipal bond index funds in my taxable accounts. I started the online training for the Canadian CFP designation. I don't have the printed material, but I do have access to the course material through the website. There is a deadline at the end of February to turn in some assignments, so I need to get to work. Fired up the browser, opened the course, went through the slides, took notes in a notebook, did the online quizzes. Then it occurred to me that taking notes in cursive writing in a notebook is probably not the way higher learning is done anymore. I should probably be taking notes on a computer or a tablet, storing the notes in the "cloud", maybe doing some social networking with my fellow students, take some ADHD drugs to improve my concentration, and be sending cheat notes with Snapchat. Taking notes with a pen in a three ring binder is so old-fashioned. Take apart hair trimmer, solder in new battery, re-assemble, and it works. Edit videos and upload to Youtube (see previous). Turn old PC into home file server using Freenas, then turn it into a media server by enabling DLNA plugin and configuring the storage. Reconfigure PC BIOS to boot from a USB stick instead of hard drive or CD. Open a UNIX shell and use ancient UNIX commands to check out the directories, permissions, make file links, edit files, etc. It is amazing that people still use UNIX, which was considered a "techy OS" in the early 80's. Some part of my brain is still intact from back then because I remembered the commands cd, ls, ..
Next step is to set up my Raspberry PI microcontroller and create a new widget. One of the questions in my career search is "why not go back to the telecom equipment industry" - I worked there for 20 years and also have 7 years experience with the customer (Wireless Operator)? I am referring to the BIG Telecom Equipment industry, not the startups doing apps, specialty products and services, niche players. First, the big telco equipment industry continues to consolidate according to the usual process of national, then regional, then global consolidation to a few large companies with many small niche companies, as described in many articles like Telco takeovers, round 2 (CNN). Note that standalone large telecom equipment companies like Lucent, Nortel, Siemens have all disappeared in the last 10 years through partnership, bankruptcy, and mergers. This means fewer jobs, lower salaries, layoffs, and less innovation which means less interesting and less rewarding jobs. Second, for me, it would be "same old, same old", and I would like to try something new. 20 years of Nortel with the last 6 dealing with layoffs and problems was enough experience. Third, the industry is concentrated in a few geographic areas: Shanghai, Shenzhen, Dallas, Silicon Valley, Stockholm, Helsinki, Paris, New Jersey. I lived in Paris and Dallas and neither was a great fit, I am not sure that the other spots are any different. Dallas - good work environment but not a great place to live for us. Nice people and low cost of living but not much for a couple without kids to do unless you play golf or like watching sports. Paris - poor work environment but a great place to live. Nice people, nice architecture, we speak French, lots of different things to do but it is very very hard to get anything done at work. 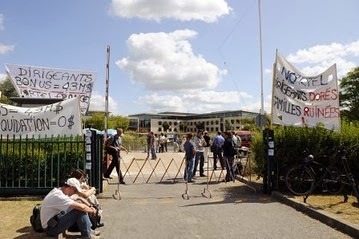 Below is a picture of the office workers threatening to blow up the Chateaufort office after Nortel's bankruptcy. 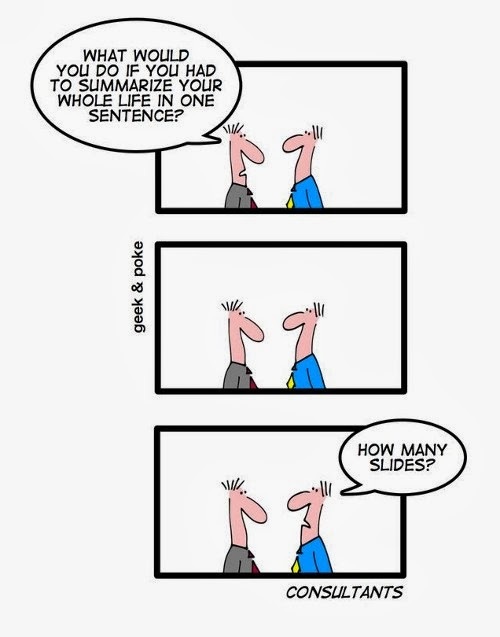 I don't think they were really serious but it gives you a flavor of the work culture. So it brings me back to doing something different like consulting with smaller companies or being a financial planner, or maybe ..? Spent yesterday catching up on paperwork, going out to a movie (American Hustle) and making a video. Managed to pay for the Canadian CFP Course after following all the rules. Only problem was an error in the website that allowed me to enter that I lived in the United States but then would only allow me to select a province and Canadian postal code. Received the forms to continue my health insurance (COBRA) - very important. American Hustle is a good movie with some great acting, think of it as a 70's take on The Sting. Created a video from the stills and video that I took on a train trip from Vancouver to Whistler. The tools available today allow even a rank amateur like me to do something that is at least watchable, way better than the old Super-8 home movies of old. I will link it to the blog. Networking - a new way to say "Let's go to the Bar"
Spent some time networking today with colleagues from NII. Rushi Shah organized a "Happy Hour" through my "Ex-NII Employees" group on Linkedin. Seems like an oxymoron to call it a Happy Hour due to the layoffs, but everyone seemed happy. 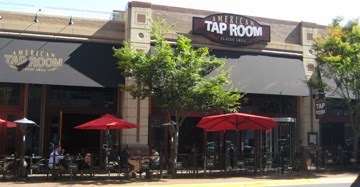 We met at American Tap Room in Reston Town Center. Reston Town Center is a "downtown" for the suburb of Reston. All the parking is hidden away and it is set up to seem like a real old-style downtown - lots of restaurants and chain stores and walkable - very pleasant but a little artificial feeling at times. When I worked there, someone asked me for some spare change on the street, which had never happened before. I swear the management of the Town Center had hired this person to be a panhandler to give more of a downtown atmosphere. Back to the networking. When I started working many years ago, we would say "let's go to the bar next door". Now we network at the bar, but it's still good. Due to the overwhelmingly positive response to my previous posting on my old job and the photo, I found some other things to post. 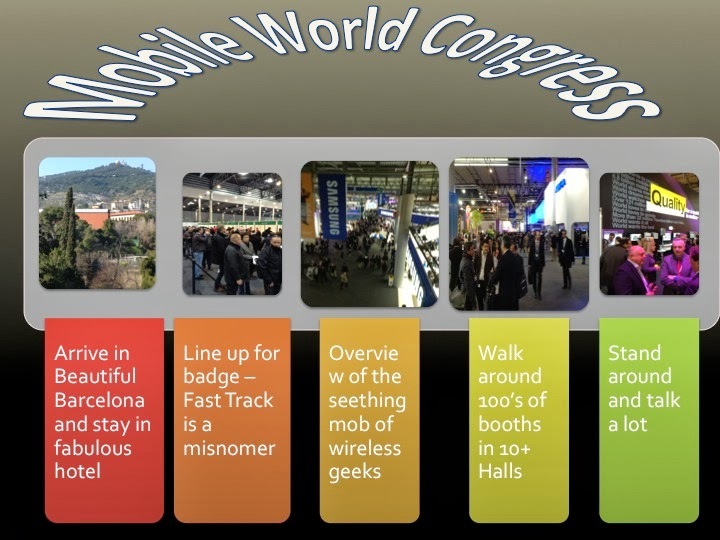 It is almost time for the biggest annual trade show for Wireless: Mobile World Congress, which is held in Barcelona in late February. This will be the first year since 2007 that I will not attend this huge trade show which usually gets over 70,000 attendees. The illustration below gives you an idea of what happens at the show and what I usually do. After reading the 42 page description of the Canadian CFP course and re-reading 4 pages of emails, I decided to go ahead and sign up for the course. Called the institute up, got someone who sounded exasperated on an unrecorded line (lucky for them). It was obviously not their day, although I did not ask why as we Canadians don't pry into other people's business. I was told to go back and fill in the personal profile online and call back after that was done, so it's back to the start of the process. On the networking front, the Linkedin group is going well and there are some initial discussions with contacts, so who knows? You may also have noticed that the blog has ads from Google. This was recommended by Google when I started the blog. Unfortunately, they must target the "strange ads" for the new blogs. When I view the blog they try to sell me things that will grow hair or otherwise enhance the male lifestyle. Either I have a weird profile or the algorithm just targets new blogs with weird ads. Don't worry about me getting rich on the blog ads and giving up on my next career, I have earned all of $0.92 so far and they only pay you when you get to $100. Now making a little progress. USA: I can do it on a plane, I can do it in the lane, I can do it any place, as long as I pay in dollars from the United States. Canada: There are two options described in a three page email with a long list of rules, and the exams are proctored in Canada. However, the information provided was very professional. The training for CFP certainly corresponds with the character of each country (see previous post). My efforts at networking with colleagues are also progressing. I started a group for ex-NII employees on Linkedin and got a good initial sign up. Here is the link: ex-NII Holdings Linkedin group. As part of my search, I am refamiliarizing myself with the differences between the US and Canada. Most non-Canadians assume that the countries are extremely similar, but having lived and worked in both countries, I would say there are definite differences. No judgements on what is better, they are just different. Canadians expect inconveniences - Americans expect ultimate convenience in all things (it should be in the Constitution). Most anything you want in the US is available as a drive-through - liquor stores, pharmacies, funeral homes, banks, ..
Canadians are more collective since they will freeze to death if they don't stick together - Americans are more individualist, although they might change if we continue to get this cold weather. My experience involve 2. and 3. I am trying to find out how to take the courses to become a CFP in the US or Canada. In the US, there are about 50 institutions offering courses live online, in classes, self-paced online, and there is competition to get your money. In Canada, there seem to be three choices for online learning, the toll free number to get information does not work from the US, and they have not answered the email I sent to the most promising of the three options. Although the pricing in Canada is reasonable, there is no competition as far as I can tell. Check out future postings to see how I get on with understanding the CFP education process North and South. What did I do before? I was a telecom executive with Nortel Networks (20 years) and NII Holdings (7 years). My jobs including being product manager for base stations and devices, general manager for GSM products, Mesh Networking, WIMAX, and VP of Technology. 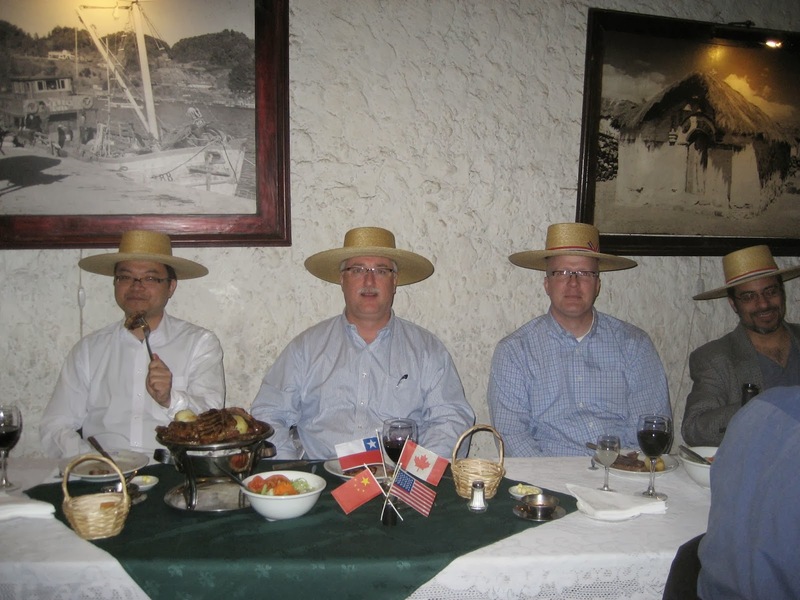 Everyone says you should add multimedia to a blog, so I have included one humorous photo from my last job where we were being entertained by a vendor in Chile at a "typical Chilean restaurant" where they make you dress up like a Chilean. There is one person from each of the following countries in this photo, can you guess which is which?